Here is why the Mazda MX-5 Miata is a popular convertible roadster, safety features. 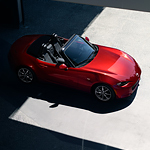 When a vehicle is moving behind the Mazda MX-5 Miata as you drive in reverse, that is when the Cross-Traffic Alert feature is going to activate. The sensors can pick up on a vehicle moving behind your vehicle and alert you in one of three ways to bring your ride to a stop until that car is moved on by. Take this all-new Mazda MX-5 Miata on the highway and watch what happens if another vehicle moves into one of the blind spots around your ride. The Blind Spot Information System will flash alerts on your side mirrors so you know which lane to avoid moving into until that vehicle has moved. The all-new Mazda MX-5 Miata is now sitting in our lot at Ramsey Mazda and waiting for you to visit us to take it out on a test drive.